London (April 30, 2012) - Nike has launched its new range for summer 2012, equipping runners with everything they need to get outside, stay cool and enjoy the warmer weather during the summer months. The collection is led by the next generation of the Nike Free - the Nike Free Run+3 - perfect for those wishing to take the first step into natural motion running, and also includes a range of lightweight, breathable apparel for men and women. Blending style and performance with its latest cutting edge sporting innovations, Nike is empowering runners to find their greatness whatever the conditions this summer. 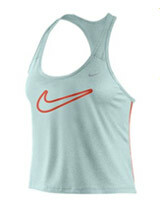 Nike has launched its new range for summer 2012, equipping runners with everything they need to get outside, stay cool and enjoy the warmer weather during the summer months. The collection is led by the next generation of the Nike Free - the Nike Free Run+3 - perfect for those wishing to take the first step into natural motion running, and also includes a range of lightweight, breathable apparel for men and women. Blending style and performance with its latest cutting edge sporting innovations, Nike is empowering runners to find their greatness whatever the conditions this summer. The latest addition to the Nike Free Family combines flexibility, comfort and support for the most advanced Free to date. Building on years of Nike research and innovation, the Nike Free Run+3 features new customisable fit technology, upper construction and a modified arch, while providing the strengthening and natural gait management benefits associated with barefoot running. Available for both men and women in a variety of colour-ways as well as on NIKEiD, The Nike Free Run+3 is the first Nike Free footwear to feature Dynamic Fit technology with �fingers� of soft material that wrap around the mid-foot and arch to move with the foot as you run, creating a glove like fit which gives runners unparalleled comfort when training. The new Nike Relay Boxy tank for women combines lightweight fabric with maximum ventilation, perfect for getting outside and making it count on warm summer days. The loose-fit top is made from Dri-FIT fabric specially designed to pull sweat away from the skin, with bonded seams for durability and minimal irritation. The rib scoop neck, armholes and racerback allow for a full range of motion, and reflective elements for enhanced visibility in lower light help runners to keep going during the long summer evenings. The Relay Boxy is available in three stylish colour-ways - green, blue and brown. The Nike Tempo Knit Shorts are the perfect accompaniment to the Relay Boxy, delivering optimal comfort on the road, track or trail. Manufactured from Nike�s trademark Dri-FIT fabric, the shorts feature a fold-over elastic waist with interior drawcord, and mesh side seam panels that help to provide unrivalled comfort. The shorts are available in a range of three attractive colour-ways. The Nike Tailwind Short-Sleeve V-Neck running shirt features soft, sweat-wicking Dri-FIT fabric and excellent ventilation for total comfort, mile after mile. Designed for staying active at the peak of summer, it offers mesh fabric panels and three eyelets at the underarm for ventilation, plus ergonomic seams that map the contours of the body for reduced irritation. A reflective cord-management loop at the centre-back neck remains visible in low-light conditions and, a zippered pocket offers secure item storage. The new Nike 23cm Men�s Woven Running Shorts with targeted ventilation are perfect for runners looking for an ultra-light, ultra-fast pair of shorts that offer ideal coverage and comfort from every angle. With an elastic waist with interior drawcord for an athletic fit, the shorts feature built-in briefs for a comfortable fit with lightweight support. Mesh side panels give excellent breathability and reflective strips ensure added visibility in low-light conditions. Nike+ Technology Nike continues to help runners become more active, stay motivated and track their performance with pioneering new Nike+ technologies, supported by www.nikeplus.com - the world�s leading running community. The Nike+ SportWatch GPS powered by TomTom offers a dynamic and motivational running experience with unique functionality, beautiful design, and direct connection to www.nikeplus.com. The Nike+ SportWatch GPS is designed for high-performance training with a clear and readable user interface that delivers the information necessary while in-run. During a run, the Nike+ SportWatch GPS captures location information while showing runners their time, distance, pace, and calories burned on an easy-to-read screen featuring a customizable layout.